Istanbul, Turkey is a city full of history. 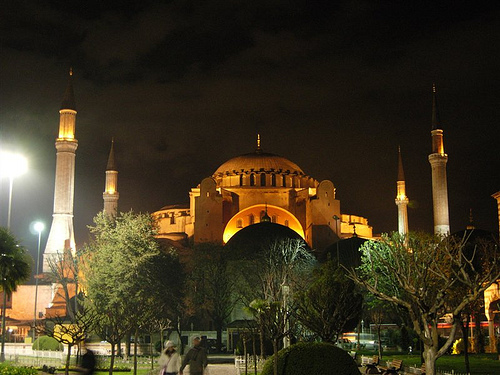 It was the capital to three empires – The Roman, Byzantine and Ottoman. As a result, there is a wealth of historic and religious places to see and wander. It is also one of the few places in the world that you can reach two continents by crossing a river — you can be in Europe one minute and then Asia the next. Go see the architecture, visit a traditional Turkish bath, smoke a nargile and take a cruise around the Borophorus. Valid for travel from August 25th – March, 2014. Use ITA Software Matrix Airfare Search and flexible month search to see availability — enable advanced routing codes and enter “ac+” on both the outbound and return fields to search only Air Canada availability. Must purchase by May 26th. 11,536 miles or 5.9 cents per mile. 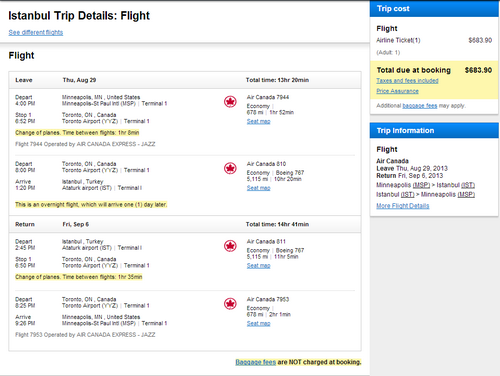 Air Canada is a member of the Star Alliance and partners with United Airlines. This fare in L class will earn 100% mileage with United. Provide the check-in agent with your United MileagePlus number to receive 100% credit. Use dates found at ITA Software Matrix Airfare Search and book on Orbitz.com. Make sure “Additional search options” is selected then check “Narrow the search to my preferred airlines” and select Air Canada to price this out.